The latest iPhone is finally here, and you can get it first from Beyond the Box - the country’s foremost Apple Premium Reseller. 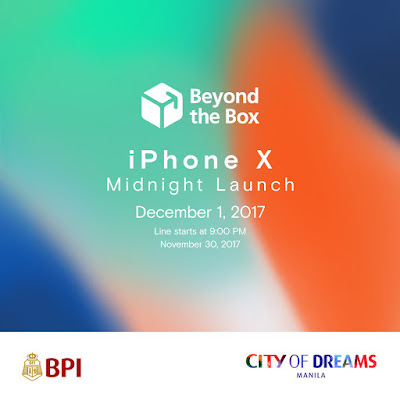 Marking its official commercial release in the Philippines, the revolutionary iPhone X will be available for purchase during a special midnight launch on December 1 at Beyond the Box in City of Dreams Manila. Experience the iPhone X’s outstanding technology in a live iOS 11 tutorial during the event. Also, get the chance to bring home a free Beyond the Box Essentials Kit for your phone if you’re among the first buyers of Apple’s most advanced iPhone to date. Meanwhile, BPI cardholders at the midnight launch get special 12/24-month installment rates for the highly coveted iPhone X. The line for the launch starts at 9:00 PM on November 30 with slots available on a first-come, first-served basis. For more information including pricing, please visit www.beyondthebox.ph or LIKE Beyond the Box on Facebook and FOLLOW @beyondtheboxph on Instagram.